About ten years ago, when I was still living in San Francisco, I had the idea to make a hypertext fiction, i.e., a story that would branch in many different directions. I tried various ways of doing this, which I won’t bore you with; the point of the story is that after about three years of struggling with this idea (during which time I moved to New York, and wrote The Facts of Winter), I more or less gave up on it. In the fall of 2003, I wrote a novel about a young man who’s summoned back to his family home in Thebes, NY, a sleepy town in the Catskills, in order to clean the house of five generations of junk. His grandfather has just died and no one else wants the job. So he goes. 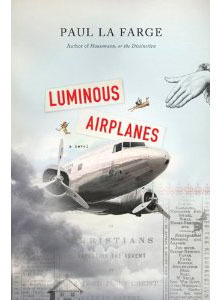 This was the seed of Luminous Airplanes, a book which would surely have been easier to finish if I hadn’t been haunted by the idea that the novel could be something more, that it could extend its branches indefinitely in the vast space of the Internet. The immersive text is online at www.luminousairplanes.com. Take a look. Or, if you’re the kind of person who likes to read the reviews first, see what the New York Times, the Boston Globe, the Economist, Time Out New York, Time Out Chicago, and the New York Observer have to say. … from Amazon or Barnes & Noble or Powell’s. Or wherever you like, really. Or go down to the bookstore and buy a copy there.